Who wouldn't want to try skin care created by none other than Olivia Newton-John?! 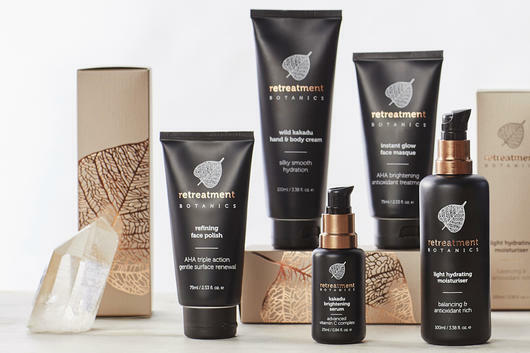 I am so thrilled to be launching her beautiful new range of Australian made natural skin care — it is called Retreatment Botanics and this guide contains everything you need to know about each gorgeous product! 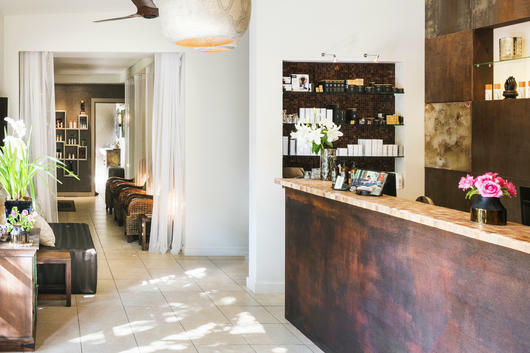 If you have heard of Olivia Newton-John's amazing retreat here in Australia, called Gaia, then you'll know it is famous for the incredible Gaia Day Spa! 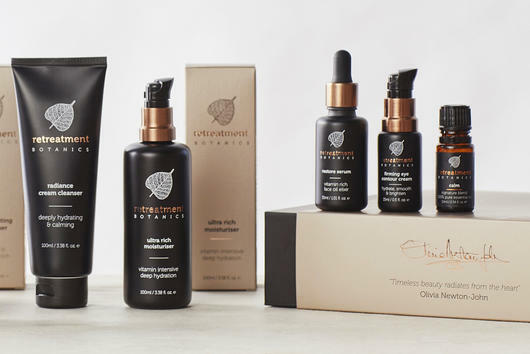 It has been around since 2005 and has won dozens of global awards, but Olivia really wanted to create a natural skin care range based around the face and body treatments offered at the spa — this is how Retreatment Botanics was born, and now it has arrived right here at Nourished Life! Retreatment is actually what they use in the day spa at the Gaia Retreat, so now you can bring the Gaia experience to yourself at home. The beautiful Gaia Day Spa. The Retreatment Botanics range took Olivia and her team of advanced natural skin experts and scientists two years to create and perfect. The range harnesses the naturally powerful anti-ageing properties of Australian native extracts, filled with antioxidants, essential fatty acids and vitamins (in order to survive the harshest environmental conditions.) These extracts are actually captured through a special process known as Cellular Extraction™ technology, allowing all of the high concentrations of nutrients in botanicals to be extracted in their natural state for maximum benefits. Cellular Biomimicry™ then captures these 'true to nature' phyto-actives for inclusion in Retreatment Botanics products, resulting in ultra potent and active skin care containing super-high concentrations of vitamins and antioxidants. The entire range is also vegan, Australian made and palm oil free! "Retreatment is so close to my heart. I long dreamt of a product range that really worked to improve my skin every day, was safe and harmed no living creatures." 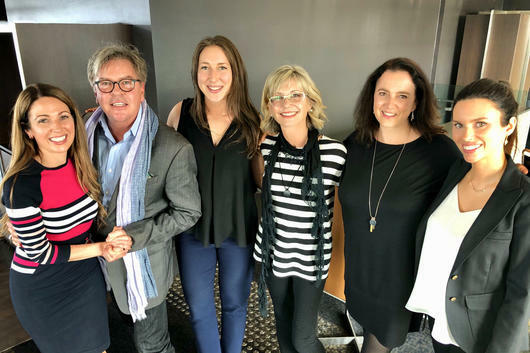 I actually had the pleasure of meeting and having lunch with Olivia and the team from Gaia Retreat and Retreatment Botanics last year to learn all about the range and what makes it so special! This was such an amazing moment for us. The NL team meets the ONJ team! There are 10+ products in the Retreatment range, but if you're not sure where to start, here is Olivia's personal daily skin care routine! 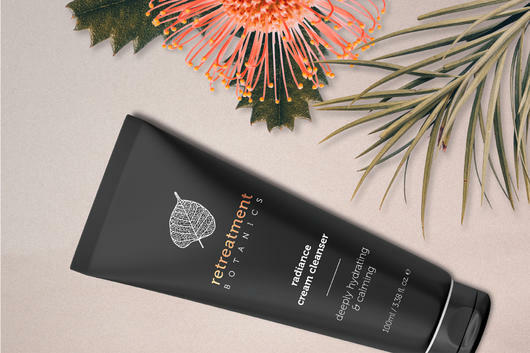 A rich and creamy formula, the Retreatment Botanics Radiance Cream Cleanser is designed to help calm, soothe and hydrate skin while deeply cleansing it of impurities, surface pollution and excess oil. Perfect for normal to dry skin types, as well as those with dehydrated and mature skin, this clarifying cleanser works to leave skin feeling smooth, soft and refreshed, enriched with moisturising Aloe Vera, Macadamia Nut Oil and Coconut Oil, as well as antioxidant-rich Kakadu Plum and Sea Buckthorn. Use morning and night. 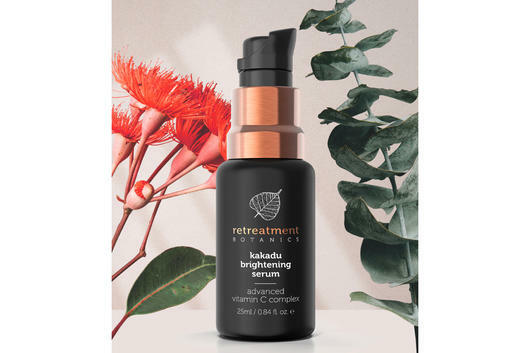 Designed as a super-strength Vitamin C serum, the Retreatment Botanics Kakadu Brightening Serum is packed with an intensive boost of Australian native Kakadu Plum, Finger Lime and Desert Lime as well as plumping Hyaluronic Acid to visibly brighten and firm the skin. Ideal for all skin types, this lightweight, non-greasy and fast-absorbing serum also works to help promote elasticity, balance oil production, even out skin tone and reduce the appearance of hyperpigmentation. Use morning and night after cleansing and before moisturising, all over the face, neck and décolletage. 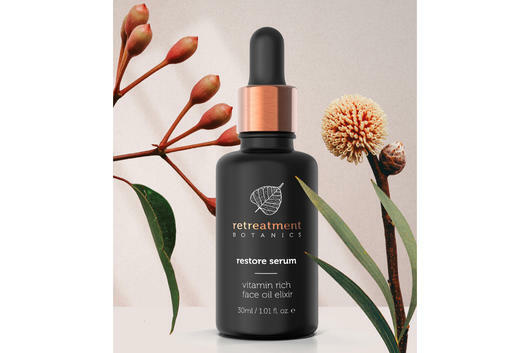 Better suited to more dry/dehydrated and mature complexions, the Retreatment Botanics Restore Serum is a potent superfood elixir designed to leave skin soft, moisturised and glowing. Nutrient rich ingredients such as Amazonian Buriti Fruit, native Sandalwood Seed, wild Rosella Flower and Kakadu Plum provide a burst of vitamins, essential fatty acids and antioxidants to help plump up fine lines and wrinkles. 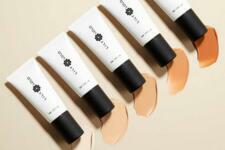 Apply morning and night after cleansing and before moisturising. 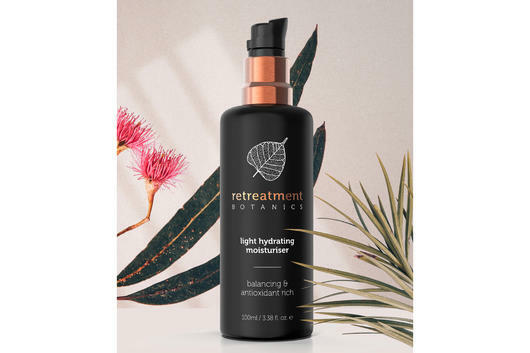 Silky smooth and lightweight, the Retreatment Botanics Light Hydrating Moisturiser is ideal for anyone whose skin only requires a light, rather than rich, facial moisturiser. Perfect for normal, combination and oily skin types, this gentle, softening formula contains antioxidant-rich native Davidson Plum, Banksia Flower, Olive Leaf and Green Tea Extracts as well as hydrating Hyaluronic Acid, Rose Oil, and Chamomile and Green Tea Extracts. Apply morning and night over your favourite Retreatment serum. 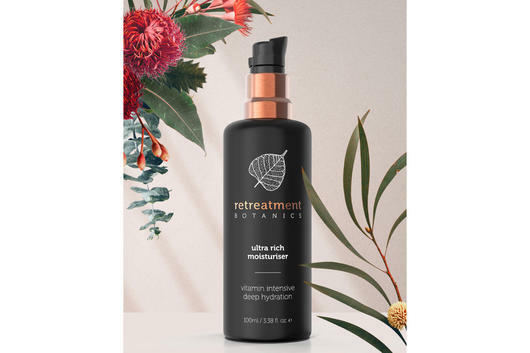 The Retreatment Botanics Ultra Rich Moisturiser is a much more intensive facial moisturiser, specially designed for dry, dehydrated and mature skin types. Pure and creamy, this vitamin-rich formula features Kakadu Plum, Mountain Pepper Berry Extracts, Sea Buckthorn and Hyaluronic Acid to provide high levels of Vitamins A, C & E as well as essential fatty acids and of course lasting hydration. Use twice daily over the top of your choice of Retreatment serum for dewy, soft and luminous skin. 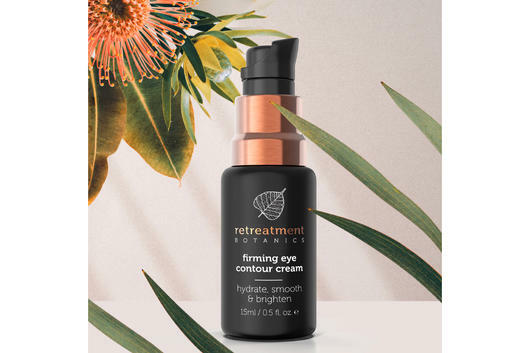 Perfect for revitalising a tired complexion, the Retreatment Botanics Firming Eye Contour Cream is formulated to help lift and firm the eye area by reducing the appearance of crows feet, fine lines and wrinkles. Antioxidant-rich Quandong, Green Coffee and Gotu Kola work to awaken skin, reduce puffiness and promote circulation, while smoothing Aloe Vera and Jojoba hydrate and plump the skin. Ideal for all skin types, it can be used both morning and night after cleansing. 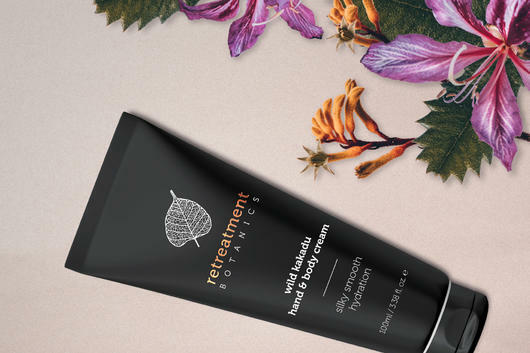 Perfect as an all over body moisturiser, the Retreatment Botanics Wild Kakadu Hand & Body Cream is enriched with creamy Cacao and Shea Butters as well as nourishing Macadamia Oil for intensive moisture. Luxurious, non-greasy and fast-absorbing, this firming formula also contains Vitamin C-rich Kakadu Plum to help leave skin looking bright, smooth and hydrated. Perfect for all skin types — gently massage into skin after bathing for soft, supple skin. 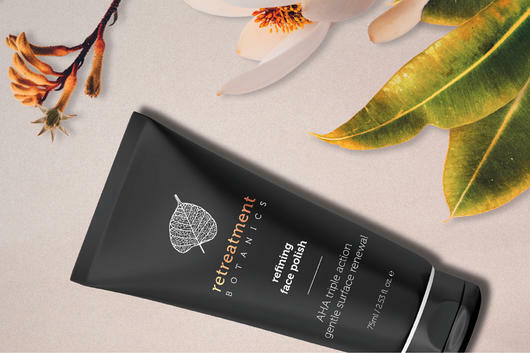 Designed to help brighten and refine skin, the Retreatment Botanics Refining Face Polish is packed with natural fruit acids and AHA-rich native Lilly Pilly to help dissolve build-up on the skin's surface. Kaolin Clay works to draw out impurities, while natural Jojoba beads gently exfoliate the skin to leave it soft, smooth and luminous. This scrub is ideal for all skin types, and can be applied to wet skin in circular motions — use 1-2 times per week. 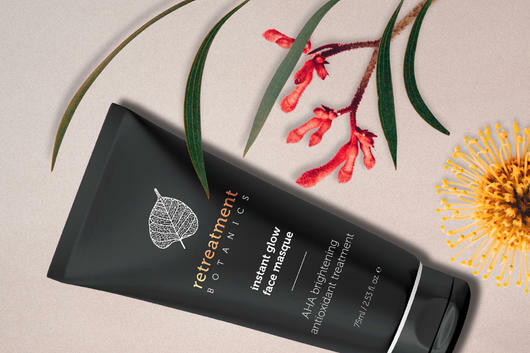 Formulated to really give our skin an 'instant' glow, the Retreatment Botanics Instant Glow Face Masque is a rich and rejuvenating blend of clarifying Kaolin Clay and natural fruit acids and enzymes from Papaya, Kakadu Plum, Emu Apple and Bilberry. Skin is left radiant and glowing thanks to this special brightening formula, and it is also suitable for all skin types. Simply apply after cleansing and leave on for 15-20 minutes, using once a week for best results. You can really recreate the spa atmosphere at home with the Retreatment Essential Oil - Calm Signature Blend, the signature scent of the Gaia Retreat & Spa! This deeply relaxing blend contains 100% pure essential oils including Sandalwood, Patchouli, Ylang Ylang, Lemon Myrtle, Mandarin and Lime to help you create a sense of calm and tranquility. Add 3-5 drops to water in a diffuser or oil burner. 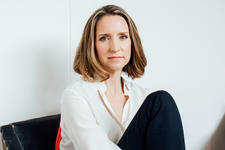 Watch Olivia introduce Retreatment Botanics to Nourished Life below!